SVSU students, faculty, and staff participate in key projects that improve the community and the quality of life for its residents. The Community Engagement Classification by the Carnegie Foundation is the ultimate validation that SVSU’s culture of ‘giving back’ is at all levels of the organization, and that we provide meaningful ‘real world’ learning experiences for our students. Some 577 students contributed almost 8,500 hours of community service performing everything from cleaning parks to tutoring (2012/13). Two on campus living communities, Living Leadership and Cardinals in Action, are desirable for incoming and returning students who desire to participate in community service projects and make community service an integrated part of life. In the 2013/14 academic year, 5,133 students participated in service learning courses, or 42 percent. Over 100 children participate in each Community Youth Day. Business sponsorships help offset costs of giveaway promotions such as bicycle helments. A $250 scholarship contribution is awarded at each Community Youth Day. 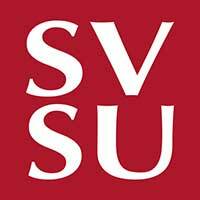 The SVSU Osher Lifelong Learning Institute (OLLI) is a member-based organization that offers non-credit educational programs & travel opportunities for the over-50 population. OLLI is one of six entities under SVSU’s Center for Business and Economic Development. This Center coordinates community engagement activities that improve the region’s economy by providing technical support for local businesses, personal/professional development opportunities, programs/services for the manufacturing sector, and commercialization of ideas/inventions. Other entities include: Michigan Manufacturing Technology Center; Continuing Education Office; Osher Lifelong Learning Institute; Career Services; Independent Testing Laboratory; and Saginaw Valley Research and Development Corporation. SVSU's OLLI program continues to grow, and has 1,600 members. SVSU was the first university in Michigan to receive the designation as a Osher Lifelong Learning Institute (OLLI) from the Bernard Osher Foundation in 2005. SVSU’s Great Lakes Regional Youth Leadership Institute is an academic year-long community outreach program that provides leadership training for high school students from diverse racial, cultural, and socioeconomic backgrounds and SVSU student mentors so they acquire the skills necessary to lead community improvement projects. It is funded by several regional partners, including United Way and Salvation Army. SVSU students and faculty participate in key projects that improve the community and the quality of life for its residents.